After a the brief "cooling down" in Mampurog River, Tutubi and his friends trouped to the beach of Bagasbas for some "beachy" fun. It's Tutubi's second time on the beach being touted as one of the best surfing beach for beginners. The local surfing school offers surfing classes for those who want to learn the rudiments of the exciting water sport. From Manila, take Superlines, Daet Express, Philtranco, or Raymond Transportation bus to Daet. 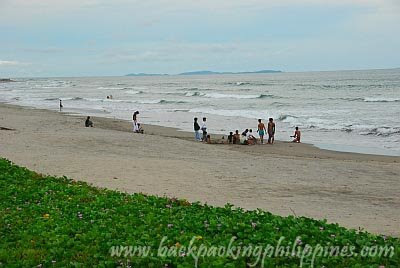 Take a tricycle to Bagasbas Beach, it's just a tricycle ride away from Daet town proper. the sand of Bagasbas is like the grey version of Bora's. i like these types of beaches more. you tend to focus on the beauty of beach itself and not the surrounding beach culture of porma, booze and partying. I spent some time on the beach today. Great fun and atmosphere. I like the variation in your photos here. I see how pristine the beach could be. Maybe, it could be the next big thing, just like Bora had been once before. That beach looks inviting, is it normally that quiet there, not over crowded? my kind of place to relax! Nice surfer and frisbee action shots! Great pictures - just like being there myself - looks so tempting! hey i think because of our exchange a few months back, my friend Matthew Calabig found me!!! i think he googled his name and found your blog and mine. nice pics and wonderful trip. Oh wow Tutubi... very nice place! At a-la Baywatch ito! Did you also surfboard? Lovely beach photos! Inggit ako...I love that children of BAgasbas photos from the slideshow, sobrang innocent. The frisbee action is cool! I've been to Bagasbas. The beach and the waves are good but the 20+ "beerhouses" lined along the beach is really an eyesore. Super dami and buhay-na-buhay to think that we were there on a good friday (holy week). Can't enjoy the night at the beach because lots of "pokpoks" were keep on coming to my place to offer their stuff. hahaha what a holy week we had there. You guys seem to be having a lot of fun down there. The beach looks great and the lifeguard scene is definately a step in the right direction. I hope you get lots of crew down there to boost your local economy and create a cool safe surf scene there. I'll be down there soon and hope to meet you guys. any driving school in daet? i must agree, Bagasbas has a lot to promise, and even the Calaguas, it's so pristine and yes, it could really surpass Boracay's thought about beauty...I just hope that it doesn't get exploited like that of Boracay..By the way tutubi, nice blog and pictures! and I'm very fond of Camarines Norte especially Daet because it's where my roots are. :) Kudos! These pictures are looking very beautiful. I want to add these pictures in my collections.